Other photos: SUNSEEKER 75 YACHT YOEL I, SUNSEEKER 75 YACHT CABIN 2, SUNSEEKER 75 YACHT KITCHEN, SUNSEEKER 75 YACHT CABINE 1, SUNSEEKER 75 YACHT CABINE 1, SUNSEEKER 75 YACHT CABINE 1, SUNSEEKER 75 YACHT CABINE 1, SUNSEEKER 75 YACHT TOILET CABINE 4, SUNSEEKER 75 YACHT CABINE 4, SUNSEEKER 75 YACHT CABINE 2, SUNSEEKER 75 YACHT TOILET CABINE 3, SUNSEEKER 75 YACHT CABINE 3, SUNSEEKER 75 YACHT CABINE 3, SUNSEEKER 75 YACHT OUTSIDE STERN, SUNSEEKER 75 YACHT FLYBRIDGE SPACE, SUNSEEKER 75 YACHT FLYBRIDGE CONTROL, SUNSEEKER 75 YACHT MACHINE CABINE, SUNSEEKER 75 YACHT MACHINE CABINE, SUNSEEKER 75 YACHT BOW SPACE, SUNSEEKER 75 YACHT BOW SPACE, SUNSEEKER 75 YACHT STERN SPACE, SUNSEEKER 75 YACHT FLYBRIDGE SPACE, SUNSEEKER 75 YACHT FLYBRIDGE SPACE, SUNSEEKER 75 YACHT FLYBRIDGE SPACE, SUNSEEKER 75 YACHT INDOOR BOAT CONTROL, SUNSEEKER 75 YACHT SUNSEEKER 75, SUNSEEKER 75 YACHT CABINE 1, SUNSEEKER 75 YACHT, SUNSEEKER 75 YACHT, SUNSEEKER 75 YACHT, SUNSEEKER 75 YACHT, SUNSEEKER 75 YACHT, SUNSEEKER 75 YACHT, SUNSEEKER 75 YACHT CABINE 2, Photo 35, Photo 36, Photo 37. Yacht of the prestigious Chef Joël Robuchon. 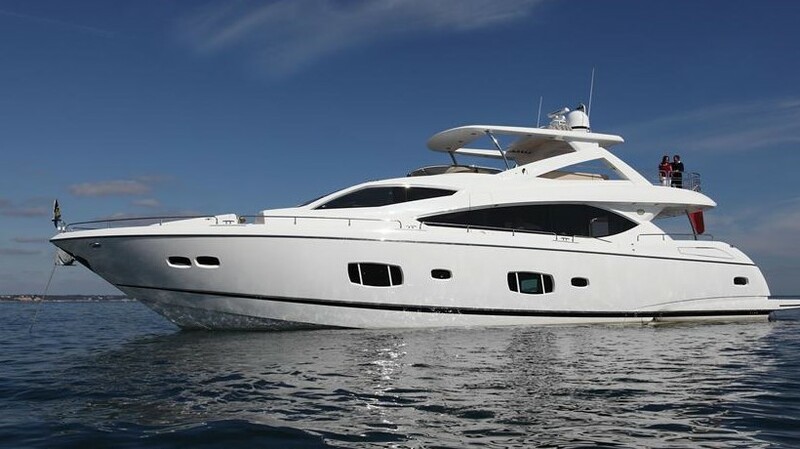 Delivered in May 2016, this immaculate 75 Yacht is presented in as-new condition. she has a truly bespoke Super yacht interior styled by renowned designer Stuart Jones. He has created an ultra-modern theme throughout using the very latest grey satin “Tabu” oak cabinetry, contrasting with highly detailed silk, leather and suede soft furnishings. European light oak floors finished with ‘white gold dust and mother of pearl’ varnish, combine with white carpets to finish off this wonderful décor. ‘glass bridge’ navigation equipment, premium Harmon Kardon 5.1 AV system, full Mediterranean air conditioning, passerelle, hydraulic platform, flybridge hard top with opening centre section, water maker, twin 27kW Onan generators and much more. Although fully MCA coded – offering opportunities for a future owner, she has never been used for charter and maintained by an experienced captain since handover. Worldwide delivery can be arranged at additional cost, please ask for further details. Two 19" Simrad MO19 displays. Simrad NSO evo2 processor and Simrad OP40 Controller and SD card reader. Simrad Autopilot repeater IS40 pilot display and QS80 pilot keypad. Two Simrad NSS12 evo2 colour 12.1" Multifunctional touch screen Chart Plotter displays. VHF, stereo, synthetic teak decking, LED deck lighting, overall cover and tie-down kit is available by separate negotiation – new Spring 2016. SYS Yacht Sales is pleased to assist you in the purchase of this vessel. This boat is centrally listed by JUAN BELLIURE.